Heavy duty PVC glue for pipes and fittings. It is suitable for both water supply and sewage piping applications as well as PVC fitting applications. 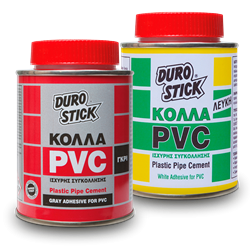 The viscosity of DUROSTICK PVC GLUE is ideal for filling the allowances between pipes and fittings resulting in unbreakable bonding. Suitable for water supply and drain piping. It is also suitable for irrigation and industrial piping as well as pool and spa piping. Suitable for all schedules of PVC piping through Ø 400mm. Rated for pressures up to 16 atm. It may even weld PVC pipes without the use of couplings (face to face joining). The container cap has a built-in round brush for easy applications.